Make a list of your barest essentials before packing to avoid the temptation of overpacking. Wear your bulkiest items (like heavy coats and boots) while in transit to save up on luggage space. Roll instead of fold and when possible, nest items within one another. To truly maximize your space, use vacuum packs and packing cubes. As clothes tend to take up the most space in your luggage, bring only a few days worth of outfits and pack laundry detergent to minimize the number of outfits you need to bring. 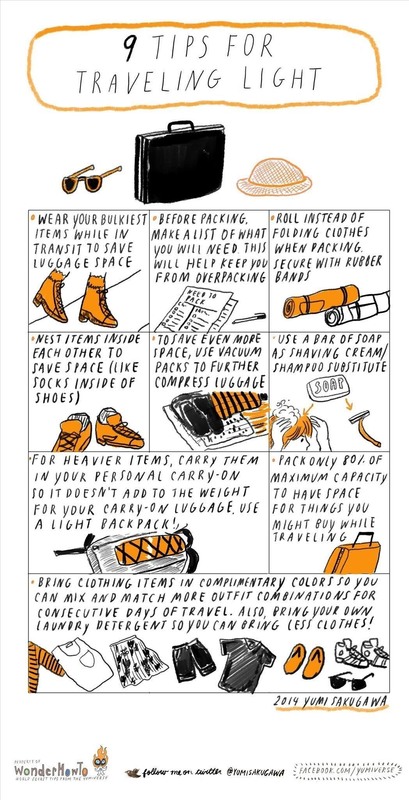 Got your own tips for traveling as lightly as possible? Share with us!